Information supplied by Wikipedia shows the Cessna 208 is a single engined turbo prop aircraft with fixed tricycle landing gear. It is used as a short haul regional airliner and typically seats nine passengers and can also be used for cargo carrying and fitted with floats or skis. Variants can also have an underbelly cargo pod fitted for extra freight or passenger baggage. The prototype first flew in 1982 and a cargo version was developed. A further variant was established for Federal Express with a stretched fuselage, an extra 4 feet, and underbelly pod which first flew in 1986 and was designated the C208B Cargo master, and from this the passenger version of the 208B, the Grand Caravan was produced. It is these two variants that are represented in this aircraft. The aircraft initially had a single Pratt and Whitney Canada PT6A-114 engine which producing 600 SHP (Shaft Horse Power) and this was upgraded to a Pratt and Whitney Canada PT6A-114A engine which produces 675 SHP. Various air forces used the aircraft and a livery is included for the Brazilian Air Force. The aircraft has four doors with one for each crew member, a passenger door with stairs on the starboard side and a cargo door on the port side. The 208B has a fuel capacity of 335 gallons, a maximum operating speed of 175 knots and a service ceiling of 21, 900ft to 25000ft depending on the variant. – CPU: Intel Core i5 6600K at 3.5 ghz or faster. – Memory: 16-24 GB RAM or more. – Realistic behaviour compared to the real airplane. – Realistic weight and balance. Tested by several pilots for maximum accuracy. – Dynamic loading/unloading of 3D parts and plugin logic for FPS optimisation. The download of the model worked very well and once downloaded the file is easy to copy across to the extra aircraft folder in X-Plane 11. The aircraft appeared in the aircraft directory as expected and was immediately ready to use. Please note this model is created for XP11 and is not compatible with XP10. The documentation folder is included in the download and contains Reference PDFs for both variants of the aircraft giving maximum speeds, angles of climb and rates of climb. There are normal and emergency check lists for both aircraft which allow more realistic simulations of flights where followed. Carenado have also supplied a visual cockpit instruments diagram which is a great help to less experienced pilots and even those with more experience and flying the aircraft fort the first time. This also helps with the use of the various checklists provided and makes the use of the model far more enjoyable. Another very useful document in PDF form explaining the use of the supplied autopilot. Whilst autopilots achieve similar results there are, understandably, many different versions modelled in X-Plane and therefore having this document available speeds the process of using this particular one. There is a short document explaining that the model contains both the passenger and cargo variants of the C208B and how to move between the two. Documentation is completed by recommended settings, credit and copyright information, altogether a comprehensive, and useful set of documents. Given that this a fairly large general aviation aircraft it is possible that it may seem a bit daunting to less experienced pilots and perhaps not as exciting as others for those who simply want to “get in and fly”. In my view both approaches would be wrong as similarities to the Cessna 172 make learning the aircraft fairly straight forward and the various versions allow the aircraft to be flown in many different ways. I decided to fly the model in several different configurations in a simple circuit from a regional airport. 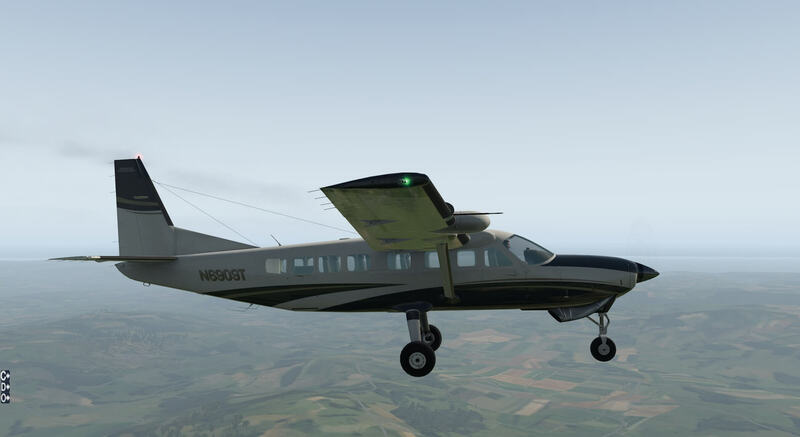 My first flight was in the Grand Caravan with the luggage pod underneath. The aircraft was light and, indeed, more sensitive and agile than I expected for an aircraft of this size. The model provided a smooth flight and reacted to weather conditions as expected with good response to control input. Light reflections on all surfaces were highly detailed and matched the movement of the aircraft, even the slightly stippled paint on top of the instrument panel. Rate of climb made life interesting, again exceeding what I expected. 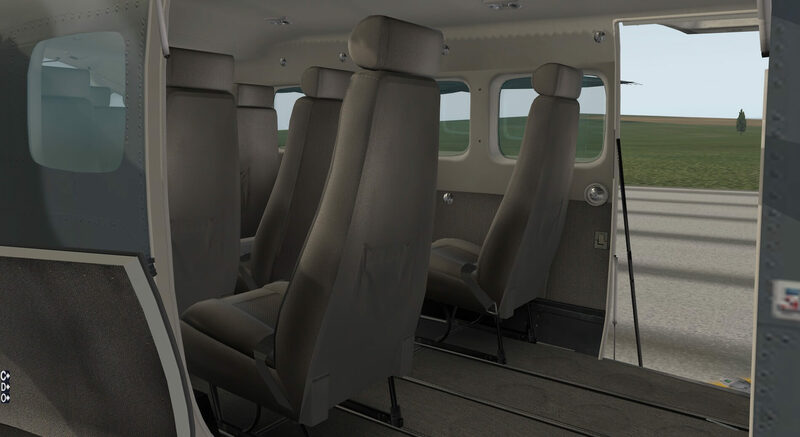 Visibility is more restricted than in some other aircraft due to seat and window positions and this is no fault of the model but the consequence of a realistic representation of the real aircraft. This means that in flight it is not quite as easy to establish position through the windows but this does become easier with practice and fixing on more distant points. My second flight was in the Super Cargomaster without load. Again the model was very responsive and had an impressive rate of climb. This made it quite challenging not to keep climbing and lose position but a great aircraft to fly. The third flight was in the Super Cargomaster in loaded configuration. I thought this would be the hardest but the model is true to life with take off being longer, rate of climb slower and more power needed to maintain position. I found this the easiest to fly as things were just slowed down enough to give me time to think and attempt to get things right. Be careful on the landing as remember there is more weight to put down. 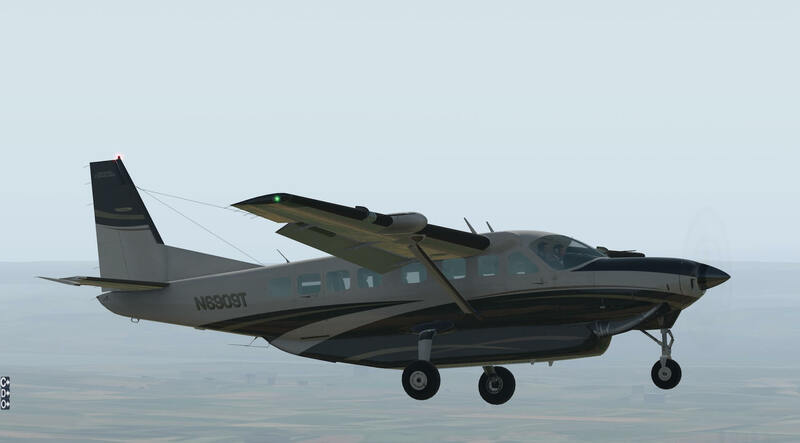 My fourth flight was in the Grand Caravan with no cargo pod. The model was very light and responsive and as you would possibly expect as they are from the same family, not dissimilar to flying the Cessna 172. I also used the normal procedures checklist provided to go from dark and cold to take off. 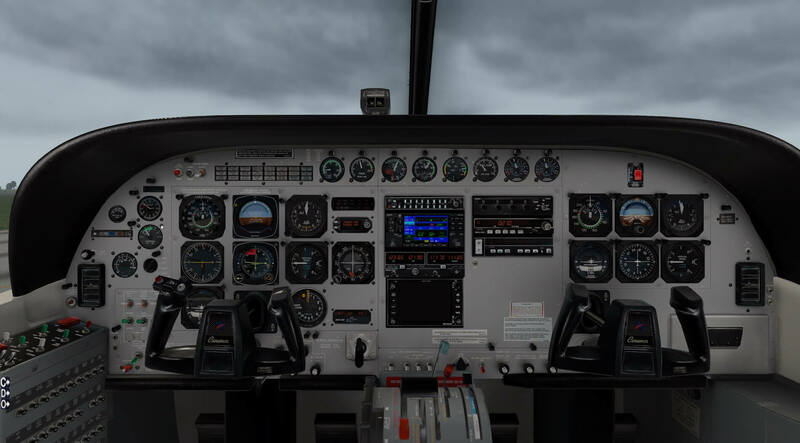 Even with the checklist, and the instrument diagram, this took a little time to locate all switches and controls but after a couple of attempts I knew where to look and the process became more straight forward. This adds to the realism of going through all the correct procedures and made me consider the process and do things properly, appreciating the detail provided in the model and the challenges of making a correct flight. This is an enjoyable aircraft to fly in all configurations. It is great to jump in and fly all the way up to using the supplied lists in the documentation for those seeking a total flight experience. For those who just want to fly there are enough different options to make the use of the model interesting without looking for other aircraft types. This is a well produced model and the movement of flight surfaces is smooth and accurate. The interior of the aircraft is clear, sharp and detailed. There are marks on the aircraft showing a degree of wear and tear, for example on the windscreen and also on the carpet showing wear made by different configurations of the seating. The detail extends to textures and stitching on the seating and accurate modelling of the numerous surfaces and equipment both in passenger and cargo configurations. Light and shadow move across the interior of the model very realistically. I would recommend using the “Show Instrument Click Regions” option in the View menu to establish all the functioning switches, levers and other areas of the cabin. The diagram provided with the documentation file also speeds the process of learning the cockpit. It is also useful to know that the yokes can be removed from view by clicking on the Caravan logo in the centre and can be returned by clicking on the boss remaining on the panel, allowing for a clearer view of the instruments. The instrumentation remains clear when zoomed and straight forward to read in flight. Labelling on the auto pilot, transponder and GPS when the mouse is placed over switches is a really helpful addition. Surfaces such as the sun visors and arm rests can be moved with the mouse though I would suggest practicing with the visor prior to flight as it moves in numerous ways and I ended up with it right in my line of sight when flying! The doors and windows can be opened and closed with the respective handles and the doors can also be operated through the D section of the menu at the bottom left of the screen. This menu allows for all doors to be used and it changes to relate to doors for the Grand Caravan and Super Cargo master as appropriate. This menu can also be found by hovering the mouse over the edge of the control panel surround directly in front of the pilots yoke. This action enables all three of the on screen menus and is useful in flight. The C menu can be operated in either way and allows a quick and easy way to move around the aircraft allowing a choice of the pilots or co-pilots seat, the rear of the aircraft and a view of Com/Nav, Engine Controls, Switches and Fuel. This is great for learning where these various controls are and very useful in flight in order to quickly look at the instruments and return back to the pilots view. The O menu also has an option to remove the tint from the windows. In the Super Cargomaster the large cargo door to the rear port side can be opened from within the aircraft and while passing through the hold, in order to do so, it is worth noting the attention to detail shown by Carenado as the labelling of the freight corresponds to the livery of the aircraft. The load in the hold can be changed through the O menu to the bottom left of the screen and the crates appear and disappear accordingly. 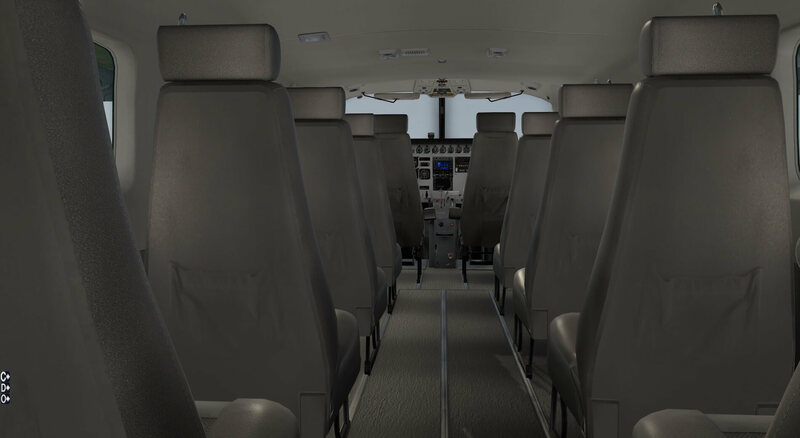 In the Grand Caravan the seating configuration can be changed from three to two across the cabin via the same O option on the on screen menu. The rear starboard passenger door can be opened by the D menu or by the handle and this then involves an accurately modelled two parts door with folding steps for passengers. This is a realistic and immersive cockpit with many variables, options and views. The documentation, guides and labelling assistance, together with changeable camera views, allow the less experienced pilot to become more familiar with the controls, instruments and systems and to enjoy the experience without becoming overawed. It is quite easy to become so involved in all the detail that you forget to fly! 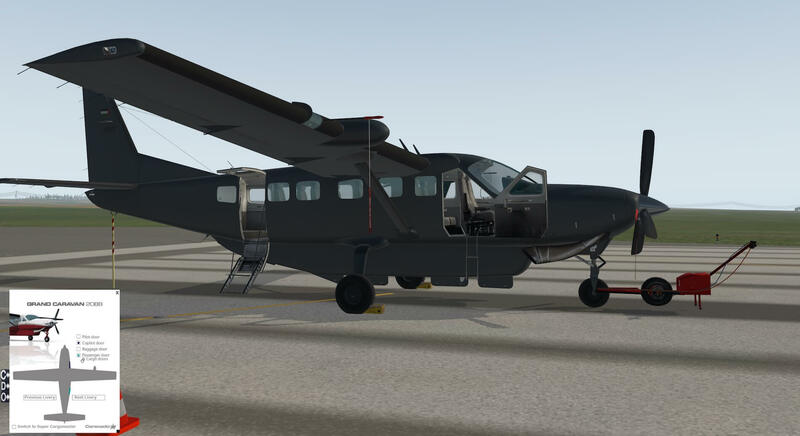 The aircraft is modelled as both the Grand Caravan and Super Cargomaster and 5 HD liveries are provided, including a blank texture, with one applying to the Super Cargomaster variant. These liveries can be applied when loading the aircraft with the X-Plane aircraft directory or through the small on screen menu. This menu also allows for the addition and removal of the external luggage pod underneath the aircraft. 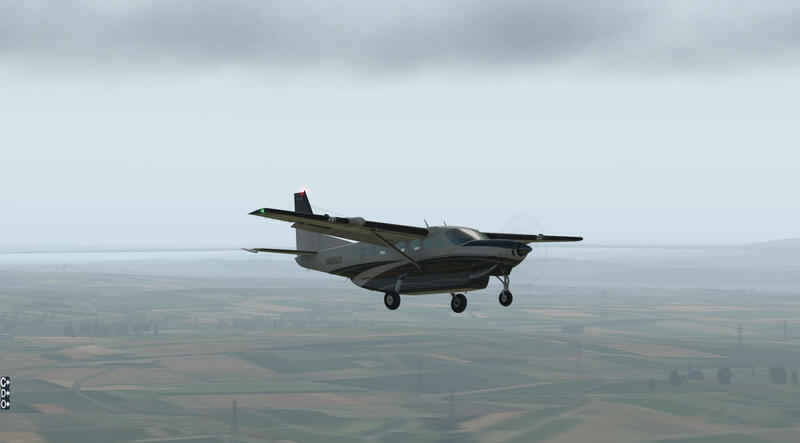 The liveries are varied and clear with one bearing the colours of the Brazilian Air Force which flew the Grand Caravan under the designation of the C98. 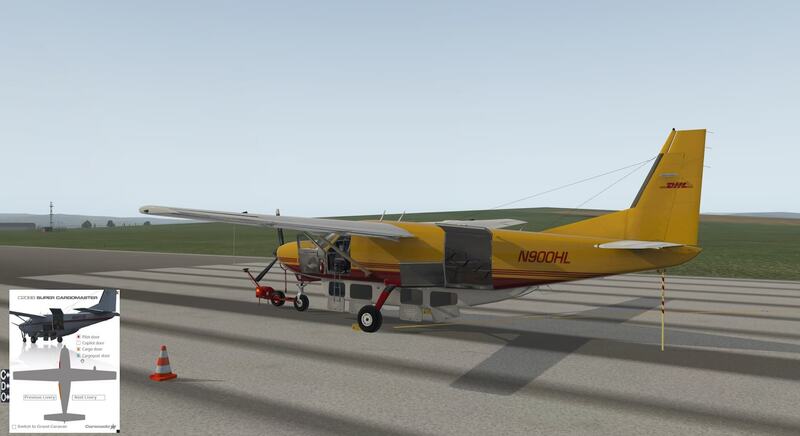 After purchase two further liveries can be obtained to represent both DHL and Fedex variants. The lettering and numbers for all liveries are clear even when close up and the aircraft lights are bright and sharp. When viewed from outside two figures are presented within the cockpit and both are realistic, clear and move independently. When loaded without engines running the menus allow options for static elements including a tow tractor, though this is not modelled to move the aircraft, wheel chocks and propellor markers. The detail of the passenger rear door can be appreciated from the outside, with its folding steps as can the small folding ladders that extend when the pilots and co-pilots doors are opened. The luggage pod doors can also be opened. When zoomed the aircraft panels are clearly modelled with detailed riveting and textures. Light, shadow and reflections are well created and move naturally across the surface of the aircraft. 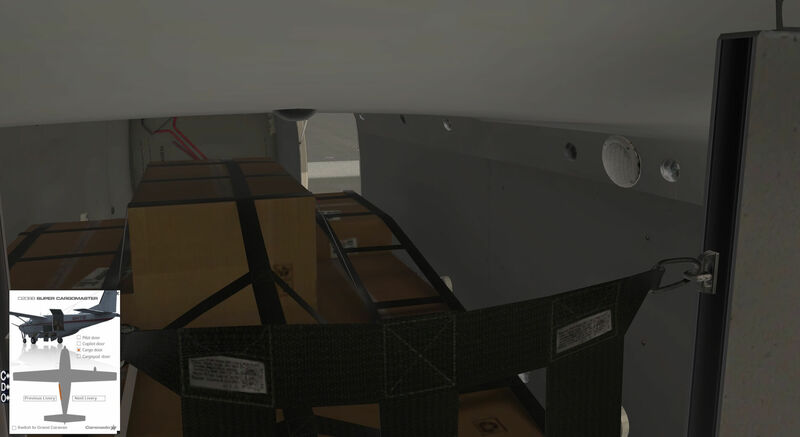 The internal areas behind the opening doors are realistic, the undercarriage is accurate and the aircraft sinks and lifts as the cargo is added or removed. 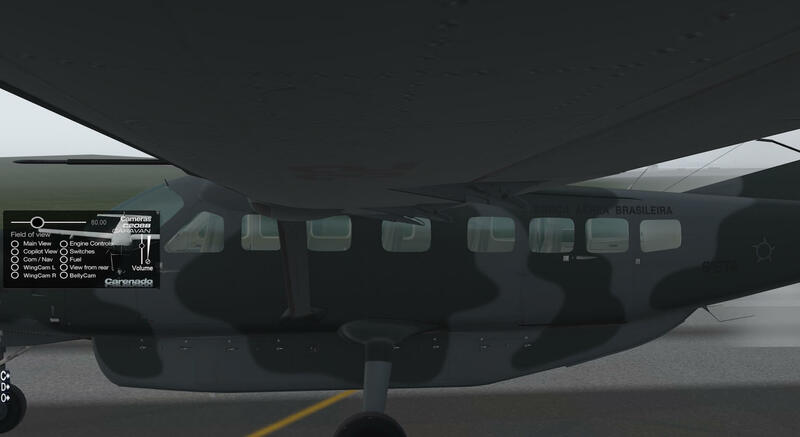 The O menu allows for the cargo pod underneath the aircraft to be added and removed and the change in the profile of the aircraft is quite marked with and without the pod. The C menu gives options to quickly change external views from both wings, and a belly cam, useful for moving around the aircraft and for obtaining different perspectives in flight. This is a well produced and convincing model which looks like images of the real aircraft when viewed on the various available internet sites. The sounds for the model are very realistic and even though there is one engine the pilot is surrounded by engine noise. The tone of the engine changes with respective throttle movements and opening windows creates the expected change in volume and effect. Opening the doors creates a very realistic sound all the way to the doors swinging back fully. Closing the doors creates a reassuring slamming sound. There appears to be one noise to confirm switch and control movement but I did find that this noise occurred wherever I clicked on the panel and screen as if moving a switch. This does not detract from the use of the model but does have a minor impact on the realism and hopefully can be resolved in future updates. The model has been equipped with auto-pilot and the X-Plane GNS 430 flight management system based on the Garmin original. The aircraft is straight forward to use in auto-pilot and responds quickly and smoothly to the system. Due to the accurate cockpit modelling the vertical speed control and altitude manager are separate from the rest of the autopilot unit but once the pilot is accustomed as to where to look for the instruments the system works well. The aircraft auto-pilot is easy to link to the GNS 430 and the aircraft readily follows the flight plan. The model continues to respond well to the environment when in auto-pilot and reacts to turbulence as expected. When flying in auto-pilot the model can be appreciated even more. The experience is immersive and viewing the flight from the different camera angles supplied in the menu allows for appreciation of the detail of the aircraft and all of the interactive parts of the model. The cockpit detail is clear and precise with numerous working dials responding to the circumstances of the flight. A really interesting model which is highly detailed and clear. The numerous variants and loads options mean that this package feels like more than just one aircraft due to the different responses in flight and the change between passengers and cargo. There is so much to interact with in this model that the pilot can simply fly and enjoy the experience or become totally immersed in a fully realistic flight. The documentation supplied makes the model more interesting with checklists to follow and emergency procedures explained. The fact that Carenado have included an instrument diagram for the cockpit amongst the documents file allows the less experienced pilot to learn the cockpit more quickly and therefore give greater appreciation to the attention to detail that the model demonstrates. 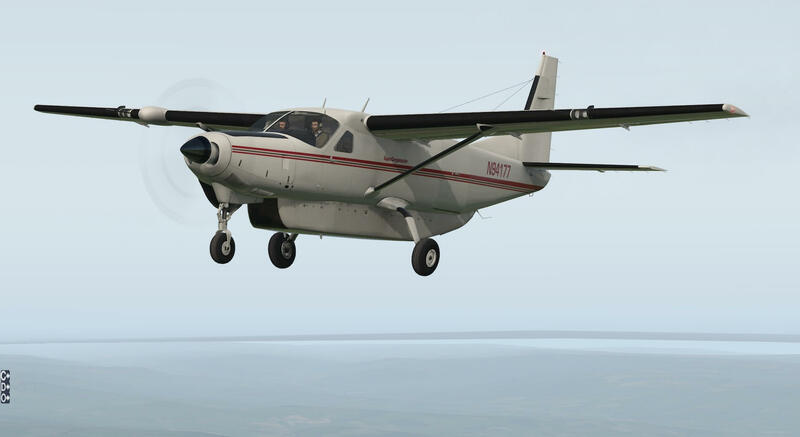 The aircraft has similarities to the Cessna 172 in terms of the cockpit and systems and makes it quite easy to learn whilst it differs enough to have its own challenges. The various configurations and liveries allow for many different flights and experiences. The detail inside and outside the aircraft is authentically reproduced and makes the use of this model all the more interesting. 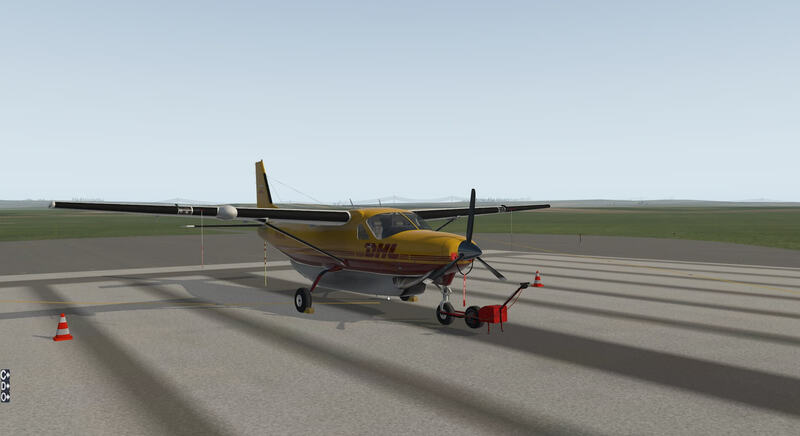 The aircraft can be used as a pleasurable model just to fly and also to create a totally realistic flying experience. More information about the aircraft can be found at the dedicated Carenado webpage (https://www.carenado.com/CarSite/Portal/index.php). 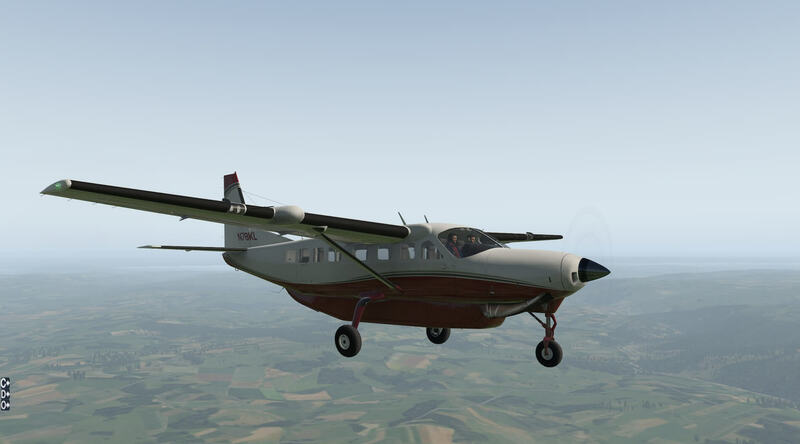 You can also buy it via the dedicated pages from Aerosoft (https://www.aerosoft.com/en/xplane/xplane-11-add-ons/aircraft/2158/carenado-c208b-grand-caravan-hd-series-xp11?c=888) and X-Plane.Org (https://store.x-plane.org/C208B-GRAND-CARAVAN-HD-SERIES-XP11_p_668.html). Feel free to contact me if you’ve got additional questions related to this impression. You can reach me via email Angelique.van.Campen@gmail.com or to Info@X-Plained.com. Have you somes informations about that please? Hopefully others can help you with this or reply on this post, but I have no idea if there’s a French manual available.